The National Gallery Singapore stopped displaying its version of Net Drying (above) by Chen Wen Hsi on its website and assembled a team to investigate if it was a fake, but results were inconclusive. The murky issue of art fraud, recently brought to the fore by a high-profile case involving the National Gallery Singapore, has perennially plagued the art industry here and looks set to worsen amid steady growth in demand for works by big-name artists, say art collectors and experts. This is especially the case for a select group of pioneer Chinese artists known for their "Nanyang" style, which blends Chinese ink painting with the techniques of Western movements such as Impressionism and Fauvism. Among them, the late painter Chen Wen Hsi's name pops up frequently when one mentions forgeries. The artist, who died in 1991 aged 85, created about 10,000 pieces in his lifetime. One of his most visible legacies is the gibbon painting featured on Singapore's $50 note. 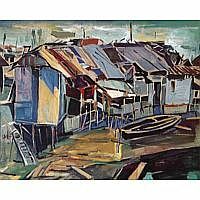 Prior to his passing, Chen told The Straits Times in a 1988 interview that fake versions of his art were rife in the local market. Last month, this newspaper reported that the National Gallery has stopped displaying an oil canvas painting by Chen titled Net Drying on its website, after a private art collector, Mr Patrick Goh, who owns a similar work, produced evidence that his piece was authentic. The gallery, home to the world's largest public collection of South-east Asian art, assembled a team to investigate the case but results were inconclusive. Managing director Allison Liu of Bergen Art Investment, who manages high net worth clients' art portfolios, estimates that more than half of Chen's paintings in circulation now are forgeries. Many are high quality fakes crafted by Chen's disciples and people close to him when he was alive, and can be tricky to tell apart from the real works, she adds. These can sell from anywhere between a few thousand dollars and $500,000, turning a healthy profit for sellers. 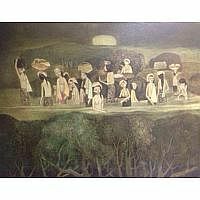 Chen's highest-selling authentic work so far is an oil painting titled Pasar which fetched $2.2 million from a Sotheby's Hong Kong auction in 2013. "It's difficult for normal buyers to spot a forgery, especially as the giveaway details are minute and hard to notice. You really have to know Chen's work well," she says. A National Gallery spokesman told Life! that in preparation for its October opening, it has gone through its collection to ensure that works to be exhibited are authentic. She added: "Depending on each artwork, these could involve detailed analysis of the artwork's condition, appearance and material composition, and research on its title, provenance, exhibition and publication history." Overseas, the picture looks grim too. China's mostly unregulated art market, worth US$11.9 billion (S$16 billion) last year according to the annual Tefaf Art Market Report, is rampant with forgeries produced by skilled artists who go to great lengths to imitate the originals. 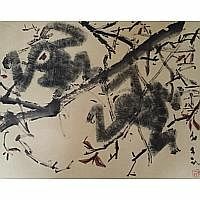 The works of Guangdong-born Chen are popular there, due to his heritage and style. Those of his contemporaries, such as Cheong Soo Pieng and Georgette Chen, are commonly forged too, says co-founder of Ins' Art International Janet Fong. Her gallery specialises in the works of pioneer artists as well as their second-generation disciples. "He's definitely popular now, as more collectors from China, Hong Kong, Taiwan and Malaysia buy his works. But more demand means more fakes going around too," Ms Fong adds. It is understood that this interest in Chen's works took off in 2011, shortly after a copyright issue requiring auction houses and exhibitions to pay royalties to one of the artist's children was resolved and the need for such payment was waived. How can buyers avoid falling into the trap of buying fakes? New buyers should thoroughly familiarise themselves with an artist's body of work and obtain as much provenance as possible. This includes information about the work, such as its previous ownership, date of publication and where it has travelled, says Dr Bridget Tracy Tan, director of the Institute of Southeast Asian Arts and Art Galleries at Nanyang Academy of Fine Arts. "You need to have art historical knowledge, intimate knowledge of the artist's works from seeing as many of his works as possible... Careful visual examination and comparison are the best authentication tools," she adds. Another collector who asked not to be named says: "Don't blindly trust auction houses. In the end, galleries and auction houses need to meet their bottom line and some of them sell fakes to survive." 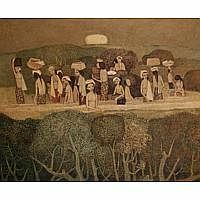 Queries sent to Borobudur, 33 Auction and Masterpiece, three auction houses that have auctioned Chen's works before, went unanswered. Both new and experienced art collectors here say there have been occasions where they were swindled in the process of building up their collection. Financial consultant David Chen, 44, parted with $4,000 for two Chen counterfeits, which he bought from unknowing private collectors. "I realised something was wrong with them only after speaking to other collectors. Now, I'm more cautious with my purchases," says Mr Chen, who started collecting in 2011. Mr Goh, a collector for more than 25 years, recalls spending $118,000 in 2000 on a work by Chinese painter Li Keran that turned out to be a fake. He sued the seller but lost as he could not prove that the art was forged. The 56-year-old retiree, who owns about 40 paintings, says: "I pick a handful of artists I'm interested in and I study their works, techniques and published books. I always say, if you buy a published piece, you can sleep in peace." Life! zooms in on similar versions of works by pioneer local artists that have surfaced in galleries and at auctions and asks experts to evaluate their authenticity. Both paintings on the right are forged and done by Liu Lang, an acquaintance of Chen's known for forging his works. 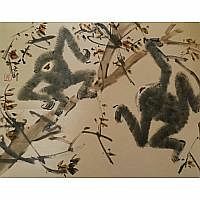 But Liu signed one painting and signed another as Chen, notes Ms Allison Liu, a Chen collector. She runs Bergen Art Investment, an agency that sources and buys art for high net worth clients. Ms Janet Fong of Ins' Art International, a gallery specialising in pioneer artists and their second-generation disciples, adds: "You can tell it's Liu Lang's work from the ink strokes. They are painted in a lifeless way, while Chen's strokes are strong and direct. Also, the composition is too similar, suggesting something is off. 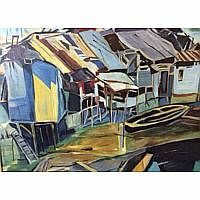 Chen always varied the composition of his paintings." The top painting on the right is forged, while the one at the bottom is real, as it corresponds to what was published by Chen in a 1987 book, says Ms Liu. Ms Fong adds: "Look closely at the paint strokes and the way they are painted. One painting looks like the color was filled in, while the other has layers, variation and texture. "As a result, one looks three-dimensional and is full of vitality, while the other looks very flat." Both Ms Liu and Ms Fong were unable to conclude which of the two paintings on the right is authentic. "It is unlikely that Cheong created two pieces that are near identical. But all we know is that the one on top comes from a private collection, while the one at the bottom was auctioned at Sotheby's Hong Kong last October for HK$2.08 million (S$359,000)," says Ms Liu. Ms Fong says: "There are very small, subtle differences. In the auctioned piece, you can see the faces are rounded, while the faces in the other piece are angular and sharp."